In a Nutshell: Even without physical branch locations, Axos Bank still places a strong institutional emphasis on community engagement and investment. Through partnerships with Hope Leadership Academy and Junior Achievement, Axos Bank provides financial education to elementary, middle, and high school students. The bank also works with the SEAL Family Foundation to offer education and support to the families of special operations forces soldiers deployed overseas. Through these efforts, and its informative blog and responsive mobile app, Axos Bank ensures communities have access to the knowledge they need to achieve financial stability. Back when he was an associate at IT consulting company Booz Allen Hamilton, John Tolla volunteered at Hoover High School in San Diego as a judge for student senior projects. Tolla, who grew up in a small town on the East Coast, was shocked by the lack of adequate resources he saw at Hoover. During the Great Recession, as many large organizations were consolidating office space, Tolla saw an opportunity to help change Hoover for the better. Today, Tolla is the Executive Vice President of Governance, Risk, and Compliance at Axos Bank. In this role, he remains involved in educational outreach and community engagement. Axos Bank was founded as a digital bank in 2000, and has since grown into a national, tech-based financial services company that emphasizes philanthropic work. John Tolla spoke to us about the philanthropic work Axos Bank supports around the country. “We have Community Reinvestment Act (CRA) programs active right now in the San Diego area, where we’re based, and the Las Vegas metro area. In 2019, we will add Columbus, Ohio, as well,” Tolla said. Even though Axos doesn’t have brick-and-mortar branches in these locations, it still emphasizes community engagement through financial support for charitable organizations and employee volunteerism. The bank provides financial education for children in elementary, middle, and high school. It also participates in programs targeted to adults, with a special emphasis on the financial and emotional well-being of military service members. Axos Bank takes a different approach to teaching financial literacy skills to school children. By appealing to the needs of each age group, Axos’ educational outreach provides a smooth transition from basic financial concepts to practical skills that are crucial to success later in life. The organization reaches elementary and middle school students through its partnership with the Hope Leadership Academy. This organization works with at-risk students in three San Diego locations. Partnering with family members, school faculty, and community members, Hope Leadership Academy takes a comprehensive approach to mentorship through academic, spiritual, and athletic guidance — and Axos Bank provides financial backing. The Hope Leadership Academy matches students with mentors who guide them in school and life. Axos provides financial education to high school students through its partnership with Junior Achievement, a national, volunteer-driven organization. Together, they promote work readiness, entrepreneurship skills, and financial literacy while fostering skill development and creativity that can expand job opportunities in the global economy. Adult financial education is a two-tier proposition for Axos. One is aimed at the general public, and the other, inspired by the significant military presence in San Diego, is devoted to servicemembers and their families. Partnerships with community organizations allow Axos to address the needs of both demographics. Through its work with the SEAL Family Foundation, Axos Bank offers education and support to families of Navy SEAL team members deployed overseas. The organization raises awareness and funds — 90% of which goes directly to services — to ensure social and financial stability for families at home. These efforts give SEALs peace of mind during deployment, allowing them to worry less about their families’ welfare back home. In the event of injury in the line of duty, Axos and the SEAL Family Foundation assist in the recovery process. Axos Bank supports programs aimed at service members in San Diego where the company is based. Those SEALs also have the opportunity to give back to their communities through One Summit, another Axos Bank partner. One Summit helps children diagnosed with cancer through experiential learning, inspirational storytelling, and community engagement alongside SEAL team members. At its indoor rock climbing event Climb for Courage, children pair up with SEAL mentors to learn how to overcome adversity and to develop mental, physical, and emotional strength. Through its partnerships with SEAL Family Foundation and One Summit, Axos Bank delivers support and financial education to families in difficult circumstances. Axos’ outreach helps those families meet the emotional and monetary challenges of their situations. Axos builds on its community financial education with a suite of online resources and tools to help customers manage their finances. These resources include an informative and educational blog as well as a mobile app for bank members. Users can personalize the Axos Bank app to alert them when spending patterns are detected. The blog delivers both personal and business financial information and covers topics including money management, cybersecurity, investing advice, and information on financial products like mortgages. It also highlights important information like the history of the Federal Reserve and its role in the U.S. economy. All of the blog articles are open and accessible by the public. Axos Bank customers can also avail themselves to its proprietary online banking app. Users can personalize the app to provide automated financial monitoring and guidance in the form of alerts and planning tools. These are divided into three broad categories: saving, credit, and spending. Users can opt into each category based on their needs. 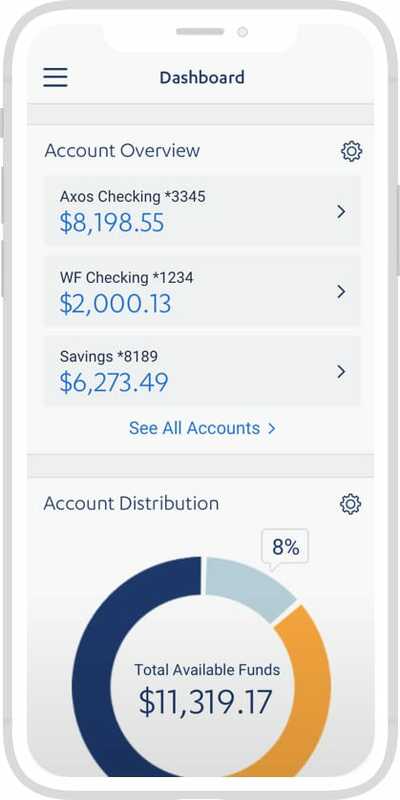 For example, customers who wish to build their savings can use the app to set a target. This goal can take the form of a specific amount (i.e., $100 per week) or can be customized as a percentage of the individual’s income. The Axos Bank app analyzes transactions over a select period and identifies those that qualify as discretionary purchases. This function helps users change the spending habits that keep them from reaching their goals. As an all-digital institution, Axos Bank doesn’t have a physical presence in most of the communities it serves. But its philanthropic efforts and commitment to volunteerism help Axos raise its profile, spread awareness of its mission to serve and educate, and build goodwill within communities. Employees are expected — but not required — to contribute at least two hours of volunteer service each year. Many of the bank’s employees contribute much more than the minimum. Out of approximately 700 staff members, about 300 are highly active in the bank’s volunteer efforts and community work. In his spare time, Tolla volunteers as a lacrosse coach at a local San Diego high school. “Our guys get, in addition to excellent lacrosse coaching, sound financial planning advice as well,” Tolla said. Through employee volunteerism and institutional partnerships, Axos Bank seeks to ensure a solid financial foundation for its members and communities at large. Its support and educational resources help everyone — including children, adults, and military service members — acquire the knowledge and skills they need to achieve financial independence and greater personal well-being.